Creatine works. There are over 300 studies proving that after protein, creatine is the #1 muscle building supplement of all time - and still is. The main goal of creatine is to deliver sheer unadulterated size and power! 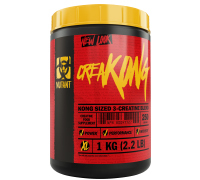 So at MUTANT, we decided to deliver the flat-out rock star of all creatines - MUTANT CREAKONG. The one and only creatine blend that delivers only pure creatines from the world's leading creatine sources, each one being patented and supported by clinical studies using actual human subjects proving that they flat out work. Get real and show your muscles you mean business! As a food supplement for adults performing high intensity exercise, take one full scoop (4 g) 20-30 minutes before workout with at least 250-375 mL (8-12 fl. oz.) of water.